My brother gave me a Norman Rockwell coffee table book years ago as a birthday gift and I have loved it so much ever since. I love it partly because he gave it to me (how sweet for him to think of one of my favorite artists and find a book on the subject) and partly because I really and truly do love a good coffee table book. The kids and I were enjoying a lazy summer afternoon the other day when I decided to share the book with them. We cuddled up on the floor next to the coffee table and went through each page and examined the stories and the subjects. They were both very interested and delighted in the art, especially K. He poured over the pages with me a little longer than his little sister and he was thoroughly engaged. For about ten or fifteen minutes. And then it was time to start running around the house in an imaginary epic battle of some sort. That was fine with me because at that age, a ten to fifteen minute art appreciation session is actually quite an accomplishment! 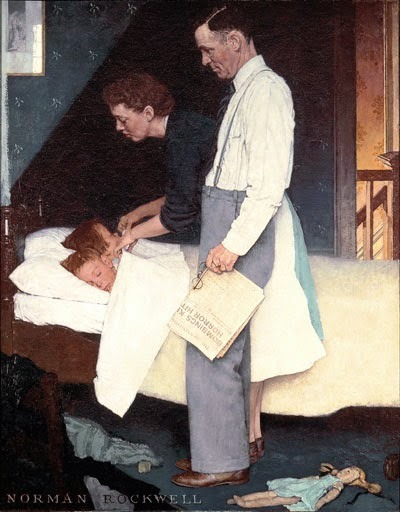 I thumbed through a few more pages on my own before I stopped on the page with the piece called "Freedom From Fear", one of four works from his series "The Four Freedoms". I was then glad that my inquisitive little guy had gone because he no doubt would have asked about the story that goes along with the image. In that moment, in that fleeting thought, I realized how timely it was to see this image. It depicts evidence of children playing earlier in the day and now sleeping peacefully, while the parents read about the horrors in the news and surely keep it from them in order to shelter them from fear. That is exactly what our life looks like with today's headlines. I see the evil and the pain that is going on in the world around us and I am so thankful that my children have the freedom from fear in the midst of it all. I hope and pray for peace in the Middle East to come soon and for those children and other innocent men and women to be able to have freedom from fear as well. My kids know nothing about the terror around the world and I am thankful that they don't. But my heart is broken and heavy that there are plenty of children who know about those evils far too well. It's just how they live. They are so brave, they have to be. The things they are witnessing are not for anyone to have to endure. 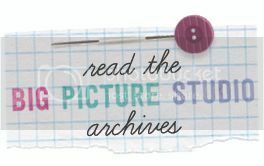 A friend e-mailed me a very convicting blog post she came across, Awake Oh Sleeper! about what we can do to love and help the innocent who are in such horrific and absolutely unthinkable danger in other parts of the world. I wish that there was more we could do. But is there really a more powerful thing than praying to the God of the Universe? I believe that is where the truest sense of freedom from fear can be found.